1877 was indeed a great year for dinosaur hunters. This was also the year of the discovery of Stegosaurus, amongst the other North American sauropods. 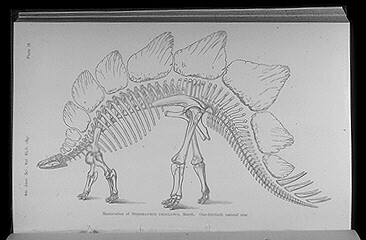 Marsh announced his find in 1877, and the following year discovered a near complete specimen - Stegosaurus ungulatus. Marsh went on to recover over 20 specimens comprising a number of distinct species. In 1886 he found the articulated skeleton of Stegosaurus stenops which had virtually all parts of the skeleton in position, finally enabling him to produce a restoration. This drawing is quite remarkable for one done over 100 years ago. Marsh stated "The series of vertical plates which extended above the neck, along the back, and over two-thirds of the tail,is a most remarkable feature, which could not have been anticipated, and would hardly have been credited had not the plates themselves been found in position." Othniel C Marsh: 'Restoration of Stegosaurus' in American Journal of Science, series 3, vol. 42 (1891), pp.179-181.